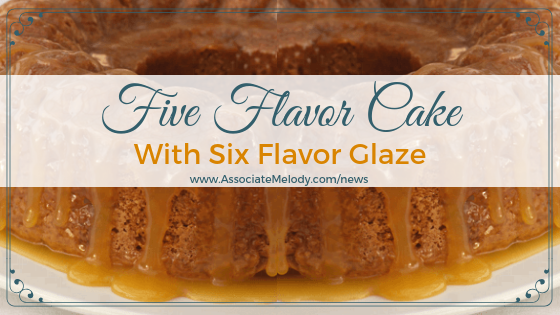 The popularity of cake recipes come and go but this five-flavor cake with six-flavor glaze has been a favorite for generations of families. It must be the delightful combination of lemon, coconut, rum, and vanilla that makes it so good. Cream together the butter, shortening, and sugar in large mixing bowl until light and fluffy. Add eggs and beat until smooth. In a small bowl, combine flour and baking powder; mix well and set aside. Combine milk and extracts. Add flour mixture to creamed mixture alternately with milk mixture, beginning and ending with flour mixture. Spoon mixture into a greased 10-inch/25-cm tube (angel food cake) pan. Bake at 325°F/165ºC for 1-1/2 to 1-3/4 hours or until cake tests done. Cool in the pan on a wire rack for 10 minutes. Turn cake out of the pan onto the wire rack, invert again. Place waxed paper under the rack to catch glaze drippings. Slowly spoon glaze onto top of hot cake and let glaze drizzle down sides of the cake. Let cool completely. Combine all the ingredients in a heavy saucepan. Bring to a boil over medium heat, stirring constantly until sugar is dissolved. (Source: the Watkins Co. where you can also find all these lovely flavors.) 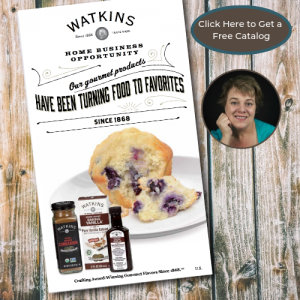 Just so you know, I’m an Independent Consultant so if you purchase through my link I’ll earn a commission. Thank you in advance. I’ve also included a printable version of the recipe below. Cream together the butter, shortening, and sugar in large mixing bowl until light and fluffy. In small bowl, combine flour and baking powder; mix well and set aside. Add flour mixture to creamed mixture alternately with milk mixture, beginning and ending with flour mixture. Spoon mixture into a greased 10-inch/25-cm tube (angel food cake) pan. Bake at 325°F/165ºC for 1-1/2 to 1-3/4 hours or until cake tests done. Turn cake out of pan onto wire rack, invert again. Prepare glaze, combine all ingredients in heavy saucepan. Bring to a boil over medium heat, stirring until sugar is dissolved. Place waxed paper under rack to catch glaze drippings. Slowly spoon glaze onto top of hot cake and let glaze drizzle down sides of cake. It’s good to hear from you Joyce, moving is a huge job! 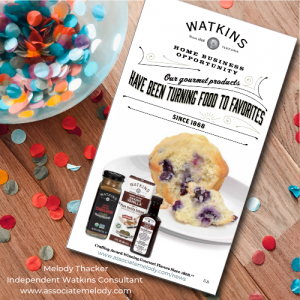 Great to hear you’ve been using and enjoying your Watkins.